On the morning of Friday, July 7, the Moscow-Paris Express pulled into Gare de l’Est, and the long train journey that had begun in Vladivostok eleven days before was over. 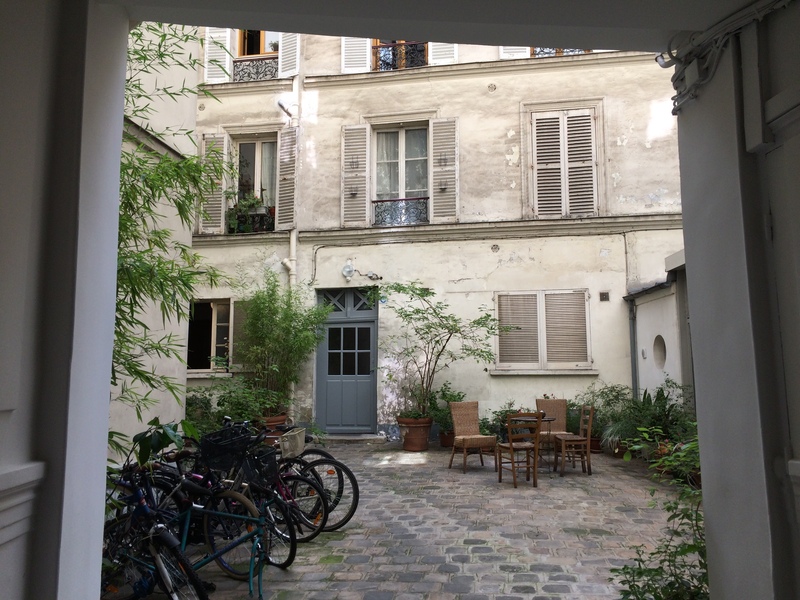 Pretty Parisian courtyard. We were on the 6th floor (or, as we say in the U.S., the 7th floor). No elevator! I was thrilled to be in Paris. And delighted to be reunited with my husband, who flew into Paris that morning to meet me. And happy to be back on terra firma and in a proper apartment, one with a kitchen and a bathroom not shared with strangers. But I was also a little sad to leave the train. Life on the rails had entailed a kind of directed simplicity that I came to appreciate. Without television or radio, newspapers (that I could read, anyway), or, for much of the time, Internet access, I felt less distracted than I had in ages. All I could do was look out the window, eat, sleep, talk to my friend Chris, chat with other passengers, read, write, and think. And yet without any effort on our part, we continued to roll inexorably along, getting closer and closer to our destination. I might have come as close as I’ve ever come to that attitude of “non-striving” much talked of among mindfulness and meditation practitioners. It was a bit shocking to leave that and thrust myself back into the world of people and news and traffic and daily, hourly decisions about how to spend my time. And now I’ve been home for three weeks, during which I haven’t even managed to update this blog, so manifold and urgent have seemed all the distractions. Anyway. I think I accomplished a lot during my ten days in Paris. I say “think” because people keep asking me how the trip has influenced the book I’m working on, and honestly: I have no idea. I mean, Dan and I went to and saw a lot of the places that Akiko and her husband Hiroshi went to and saw while they were in Paris. 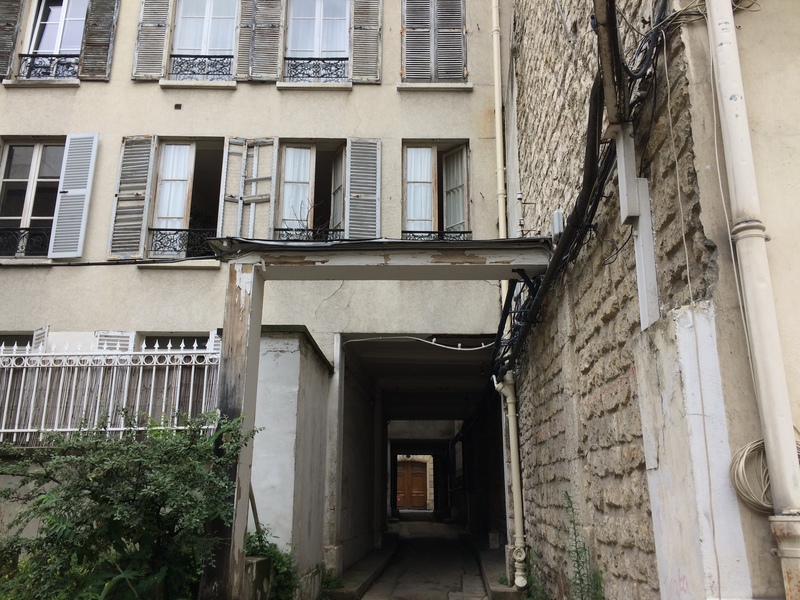 The building on rue Victor-Massé where they stayed for four months. The neighborhoods they explored on foot. The Chateau de Fontainebleau, about which Akiko wrote twenty tanka. We visited both locales of the Musée Rodin—both the crowded Hôtel Biron site in Paris and the much quieter site in Meudon, just southwest of Paris, where Rodin lived for many years with Rose Beuret. Akiko and Hiroshi and an artist friend of theirs had visited both sites as well—arriving first at the Villa des Brillants in Meudon, letter of introduction in hand, in hopes of meeting the great master, only to learn that he was at his workshop in the city. Beuret apparently lent them the use of her carriage and coachman so they could hurry back to the city. Rodin received them quite courteously, and Akiko would report that she presented him with the first two volumes of her modern-Japanese translation of The Tale of Genji. It was wonderful to be able to walk about these places and think about these events. But did I gain indispensable or even useful insights about Akiko and her trip that I could not have gained otherwise? I don’t know yet. Do I now have a clear (or even clearer) direction for the project? Not really. I have a lot of swirly ideas swirling about in my head as swirls are wont to do. And maybe that’s fine, as far as it goes. For now, anyway. I’m hoping that in the relatively near future, this “swirliness” will settle into something more coherent. 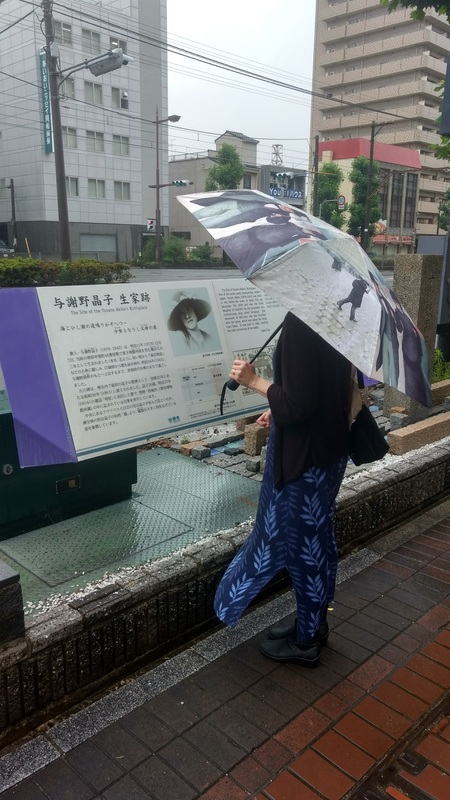 In truth, I learned more about myself during this trip than about Akiko. Maybe most trips are like that—you set out to encounter something other than yourself, but end up contending with that most persistent of travel companions, your own person, with all its baggage and preconceived notions and unmet yearnings. Those lessons would require another post, so I won’t divulge any of them here. Meanwhile, however, I have a book to write. A book for which to strive. Matsudaira Meiko, “Akiko no Pari 1912 nen” (Akiko’s Paris 1912), Part 9, Tanka kenkyū, March 2001, p. 149. G. G. Rowley, Yosano Akiko and the Tale of Genji, Ann Arbor, MI: Center for Japanese Studies, University of Michigan, 2000, p. 72. It’s Sunday, July 2, as I begin this new entry, and my friend Chris and I are back on the Trans-Siberian Railway, having traveled from Vladivostok to Irkutsk and spent a day and a half in the town of Listvyanka on the shores of Lake Baikal. It seems like we’ve been traveling for days, yet we’re not even halfway between Vladivostok and Moscow. We’ll pass that milestone sometime this afternoon. 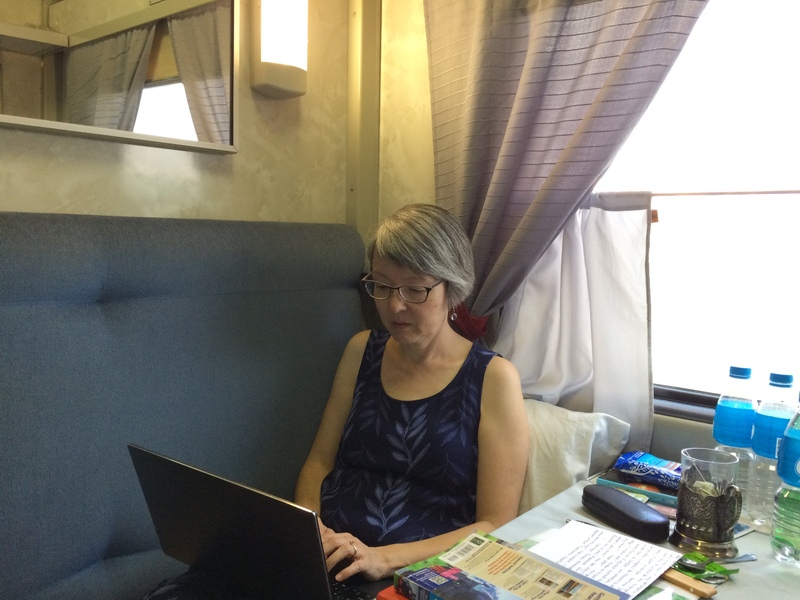 I’ve started composing this installment of my travel report aboard the Trans-Siberian Railway, late at night, someplace between Vladivostok and Khabarovsk. By the time you read this, I will likely already be in Russia. 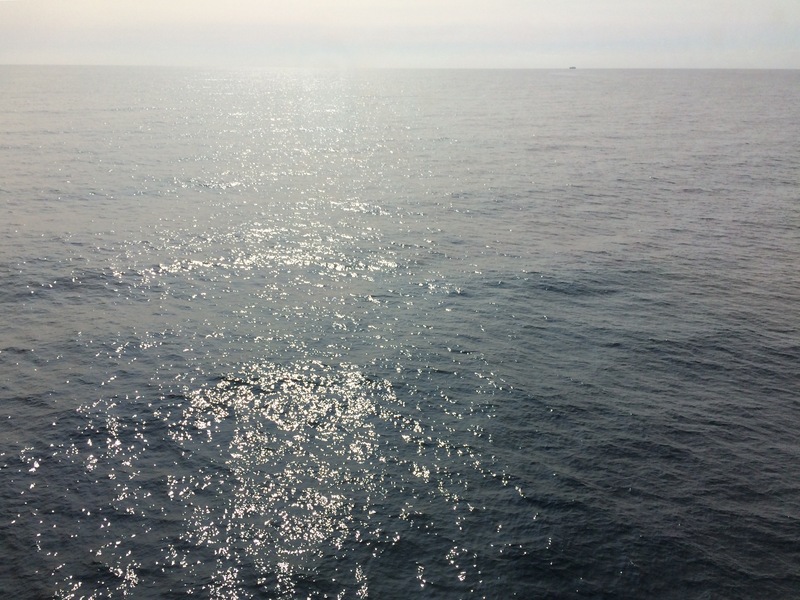 But I started drafting this post in Japan, on the shinkansen (bullet train) after leaving Osaka on Thursday, June 22, to wend my way north and west toward the port town of Sakaiminato. 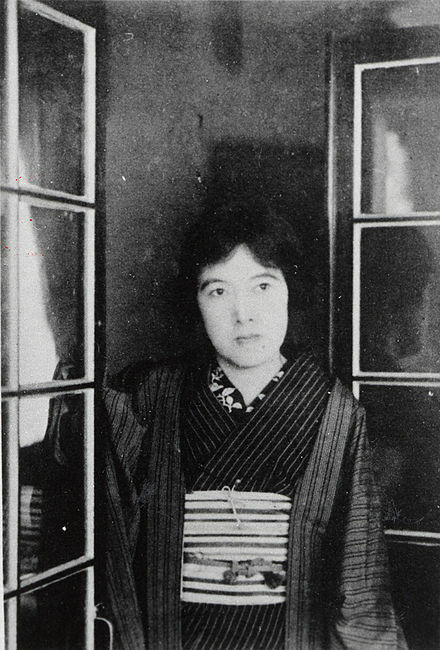 The subject of my next novel, another historical project about an epic journey, is the Japanese poet and feminist Yosano Akiko (1878-1942).